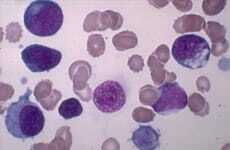 Often, leukemia lays dormant before re-emerging. Researchers believe that a resistive subpopulation of leukemia stem cells underlie our current difficulty in eradicating this blood cancer. A new study in Cell Stem Cell reveals that, uniquely, leukemia stem cells have a “slower” metabolism than other tumor cells. Researchers led by Craig T. Jordan, applied a drug to target these cells’ metabolic pathway, effectively disrupting their ability to harness energy. These results may provide a new path to creating more effective leukemia treatments.